The Russian Aerospace Forces will upgrade the whole fleet of its light fighters to the new advanced fourth generation MiG-35 fighter jet. On January 27, the United Air Corporation (UAC) unveiled the new Russian 4++ Generation Mig-35 "Fulcrom F" fighter jet. The new aicraft is based on the technologies of MiG-29M/M2 and MiG-29K/KUB aircraft with the addition of more advanced features. The event was already announced on 30 December by the Russian Deputy Prime Minister Dmitry Rogozin during a conference "The first flight of the new fighter was expected in January 2017" he said. The Russian Air Force intends to replace the entire fleet of its light fighters with the new MiG-35. 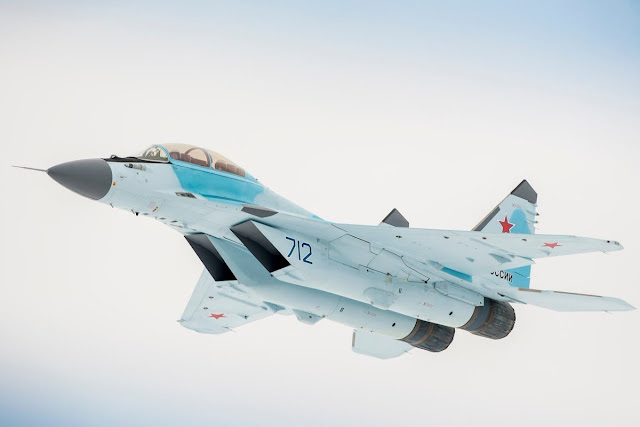 "We will buy these planes, we need them… In a short time, we will replace all light fighter aircraft with this class", the Air Force Commander Viktor Bondarev said. "After the end of the flight tests, the Russian Aerospace Forces plan to buy a first batch of 30 MiG-35s. A total of 170 aircraft will be purchased for the total replacement of the light combat aircraft fleet," he added. According to a MiG spokesman, the new aircraft will enter service from 2018. The MiG-35 Fulcrum-F is the latest version of the famous MiG-29, it has a vectored thrust engines and an advanced fly-by-wire technology. The aircraft was developed from the base of MiG-29M1, it was previously known as the MiG-29OVT (Mig-29m2 and MiG-29MRCA for two-seater versions). The MiG-35 is very agile and has a range of about 2100 km; the avionics and weapon systems have been greatly improved. It has eight underwing pylons for the loading of weapons and it is able to refuel in flight. Russia is trying to export the aircraft to various countries including Syria, Libya, Iran, Algeria, Sudan, India, Mexico, Brazil and Peru. Malaysia is considering to add Mig-35 to the current fleet of MiG-29B and the new Su-30 MKM.